I having been champing at the bit to do blogs on Alexandria Ocasio-Cortez and Jeremy Corbyn (pictured below), who between them epitomize the move toward socialism we are seeing either of the Pond. While I try to draw into my circle of Facebook friends those representing a broad spectrum of political beliefs, inevitably I have attracted those more leaning to my political thinking (which I will get to). One of the upshots is I have seen many posts in recent days demonizing both Alexandria Ocasio-Cortez and Jeremy Corbyn but given my maxim that attracting so much negativity means they must have something going for them and that I needed to be measured in my approach and, putting personalities to one side (although this does matter when it comes to delivering), rather concentrate on what they are saying and why so many have chosen to support them. As for the blogs on the afore-mentioned persons, that will have to wait for another day and after I have done the requisite research such that I can hold my own amidst dissenting voices. But I would like to set the scene, and note like most my views will be influenced by my own ideological beliefs, and dare I say it, prejudices. I grew up in the 1950’s on a Council estate, to working class parents and in a day when most people voted along class lines. My parents were staunch Labour and I followed suit. In my mid teens I began to take a keen interest in politics, and one of my heroes was Harold Wilson. I liked ideas such as taxing the rich in order to help the poor, nationalizing industry in order to benefit the many rather than the few and championing the underdog. Just prior to going to university, I got religion and was steered away from politics by my mentors. I noticed at university a decidedly leftward tendency (unlike what I had experienced in my church and school setting before that). It amused me that many of the leading lefties came from well to do families and seemed to have a contempt for authority and the rule of law. As I become more aware of what was going on in the rest of the world I observed the abject failure of socialism to deliver for the common good and as a member of the God squad noted with consternation the fierce persecution of dissenting voices, especially those of Christians, and a palpable failure to uplift the proletariat or deal with high level corruption. This marked my move away from socialism but, except for short periods, it did not mean I jumped ship altogether and go over to the opposition. While I liked the Conservative ideas of small government, free enterprise and encouraging aspiration irrespective of class, I could never be 100% convinced. The reason was because of the social justice concerns instilled in me from an early age and by adopting a laissez-faire ideological approach this could not and would not address those concerns even though over time I became increasingly disillusioned with the ability of government to do so. It is for that reason why, although I see the value of good people taking part in politics, the bigger need is a change in heart, which the gospel I preach can bring about. To complete the circle, I could never adopt the best of both world option: Liberals, Social Democrats and now Liberal Democrats. I see them as the neither here nor there party that rather than taking the best from Labour and Conservative, too often took the worst. And here I am today, looking forward at the end of the month to Brexit, realizing I and the country have been let down by all the parties. A long time ago I took the view when voting it would be for the candidate rather than the party, and I have voted from everything between Green and UKIP. I should say before I get accused of being a rabid right winger by those who have read my views on a multitude of issues, that there are certain issues I should be accused of being a radical leftie. 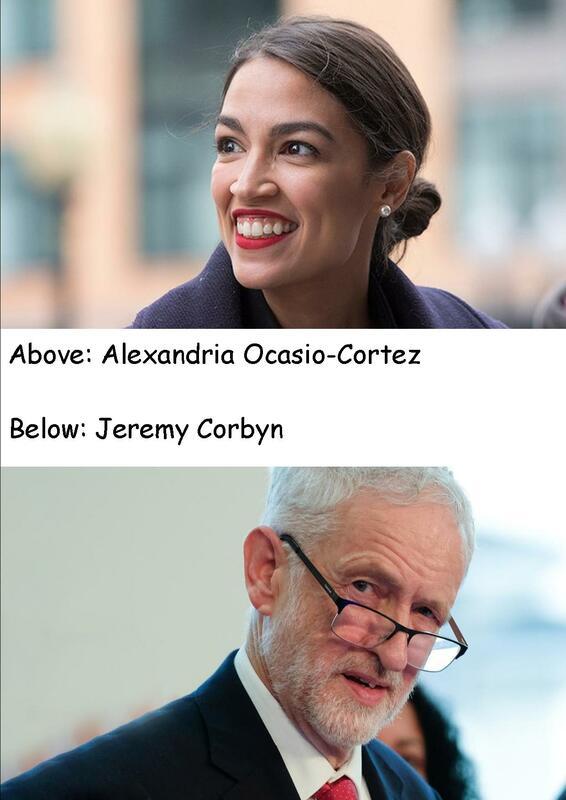 So it is back to Alexandria Ocasio-Cortez and Jeremy Corbyn. I don’t for one moment claim they are THE socialist voices in the USA and the UK respectively, mindful it is far more convoluted than that, but they have grabbed the headlines. Moreover, they have attracted large followings and are therefore ripe for my careful consideration (watch this space). I suspect concerning the reasons why I was a socialist all those years ago is then my heart ruled my head. While these days I like to think my head rules my heart and is why I would counsel those who look to embrace socialism to think twice before they do so, I still have a heart, and is why I will not dismiss what they have to say until I have considered what it is they are saying!